Backdropped by a blue and white Earth and the blackness of space, the International Space Station is seen from space shuttle Endeavour as the two spacecraft begin their relative separation on Nov. 28, 2008 during the STS-126 mission. MOSCOW - (Interfax-AVN)- Debris of the Russian space freighter Progress M-01M plunged into the PacificOcean following the ship's fiery reentry, Mission Control in Korolyov told Interfax-AVN. "Thoseparts of the space freighter which had not been burnt on reentry droppedinto the Pacific Ocean," a Mission Control spokesman said. "Thetime and the place where the debris dived into the water cannot be exactlygiven, since there are no Russian observation means in that pat of the world.But the data are not expected to differ seriously from an earlier estimate,provided by Mission Control's ballistic service with an experience of nearly 50years of doing this job, he said. The areawhere the debris dropped safely into the ocean is some 3,000 kilometers east ofthe capital of New Zealand, Wellington. It is at a long distance fromnavigation routes. Only heat-resistant parts of the spaceship reached thewater. ProgressM-01M, alsoknown as Progress 31, blasted off from Baikonur, Kazakhstan, on November 26and docked with the International Space Station (ISS) on November 30, bringingalong 2.5 tonnes of various cargo, including water, air, food, researchequipment and fuel. It was used to adjust the ISS orbit on December 17. 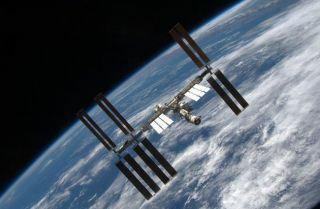 The spaceshipdeparted from the ISS on February 6 and its flight characteristics and systemswere tested by Mission Control specialists for two days before its destructivereentry. ProgressM-01M is a spaceship of a new series, fitted with a digital flight controlsystem. A ProgressM-66, also known as Progress 32, a previous-series space freighter, will flyto the ISS on February 13. Its launch from the Baikonur is scheduled for8:49 a.m., Moscow time, February 10. Head of thediet section of the Institute for Medical and Biological Problems AlexanderAgureyev told Interfax on Monday that 15 kilos of cottage cheese andfresh vegetables and fruit (apples, oranges, garlic and onion) had been loadedon the Progress. This amount should be enough for a month. In addition, thefamilies of the ISScrewmembers added chocolates and a waffle cake to the food package. ProgressM-66 is the last but one spacecraft in the 300 series which is still equippedwith analog control systems. In the future they will be replaced by spacecraftof the 400 series with a new onboard computer and miniature telemetric system.These systems were tested on the Progress M-01M spaceship launched to ISS inNovember 2008 and dumped in the Pacific Ocean last Sunday. After the completionof tests the systems will be installed in the new modification of the pilotedSoyuz spacecraft.